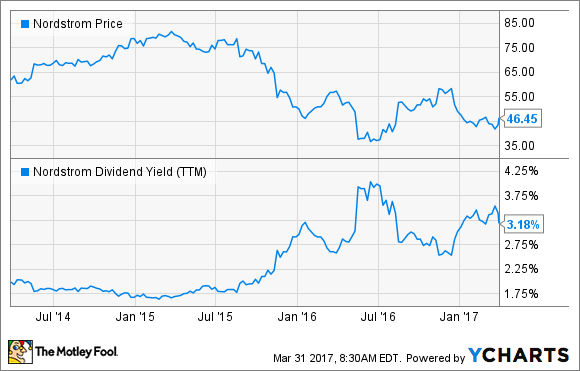 Big share-price declines over the past two years have made Macy's, Kohl's, and Nordstrom great high-yield stocks for dividend investors. Department stores have had a rough time in the past couple of years, with sales and profit falling across the industry. However, despite the tough retail climate, several top department store companies are enticing dividend stocks. Indeed, Macy's (NYSE:M), Kohl's (NYSE:KSS), and Nordstrom (NYSE:JWN) are all good stocks to buy for income investors. Steep share price declines have caused dividend yields to rise significantly for all three in recent years, and those dividends seem fairly safe. Department store stocks offer some of the highest dividend yields around. Image source: Macy's. Macy's stock plunged by more than 50% in the second half of 2015 and has fallen even further since then. It has been trading for less than $30 recently, near a multiyear low. Obviously, this has been very painful for long-term Macy's shareholders. Yet the company's fall from grace has made the stock very attractive for income investors. 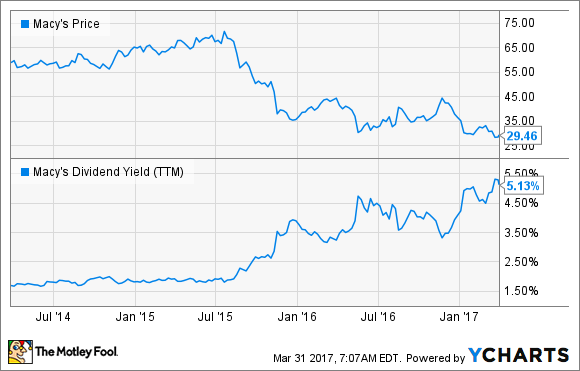 Macy's yield has surged from less than 2% in mid-2015 to more than 5% today, based on its current dividend of $1.51 per year (paid quarterly). Macy's Stock Performance data by YCharts. Macy's high dividend would be meaningless if the company couldn't afford to continue paying it. Fortunately, the dividend is fairly safe. Despite its poor performance last year, Macy's generated $1.8 billion of operating cash flow and nearly $900 million of free cash flow. That was nearly double the $459 million sum it paid out in dividends. Furthermore, Macy's is downsizing in order to cut costs and better match its store footprint to current demand trends. Meanwhile, it is steadily selling off excess real estate, generating hundreds of millions of dollars in additional cash flow. It may take a little while for Macy's to stem its recent sales declines, but the company is well positioned to maintain its strong free cash flow. Investors can be fairly confident that Macy's will continue paying high dividends for years to come. Kohl's stock peaked in early 2015, and by the middle of 2016 it had fallen by more than 50%. As was the case at Macy's, this big fall has pumped up the company's dividend yield. It's been just six years since Kohl's paid its first dividend. Now, the company's $2.20 per year payout (paid quarterly) gives it a yield above 5%, putting it near the top of the S&P 500. Like other department store chains, Kohl's has faced severe revenue and earnings headwinds in recent years. In fact, Kohl's 2016 adjusted net income of $673 million was down more than 40% from the $1.2 billion it earned five years earlier. However, Kohl's actually produced record free cash flow of $1.3 billion last year. It should be able to continue generating annual free cash flow of $1 billion or more by gradually reducing inventory, selling or renting out excess space in its stores, and cutting back on capex. That makes its current annual dividend payments of less than $400 million look very manageable. Over the past two years, Nordstrom stock has followed a similar trajectory to that of Kohl's. The share price plunged by more than 50% between early 2015 and mid-2016 before rebounding somewhat. This has raised Nordstrom's yield from less than 2% historically to more than 3% today, based on its current dividend of $1.48 per year (paid quarterly). Nordstrom Stock Performance data by YCharts. What Nordstrom lacks in dividend yield -- relative to Macy's and Kohl's -- it makes up for in growth potential. Indeed, even in last year's very tough retail climate, Nordstrom grew its sales by nearly 3% year over year. While Nordstrom's profit margin has been under pressure in recent years, the company posted strong free cash flow of about $800 million in 2016. This easily covered the company's $256 million in dividend payments. In recent years, Nordstrom has invested heavily to expand the Nordstrom Rack chain, enter the Canadian market, and build up a vibrant e-commerce business. The company's investment cycle is finally slowing, though. As these investments mature, Nordstrom should be able to return to steady earnings and cash flow growth in the next year or two. That would support future dividend growth. Investors have been fleeing the department store sector recently due to weak sales and earnings trends. However, the top department store companies -- Macy's, Kohl's, and Nordstrom -- are well positioned to weather the storm. In the meantime, all three offer hefty dividend yields supported by strong free cash flow. That makes them enticing stocks for income investors.